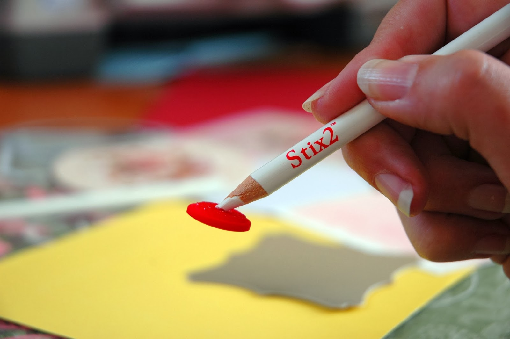 The Stix2 Pick Up Pencil is every crafters dream. This is the essential non-sticky way to pick up small craft materials, perfect for handling all your fiddly gems, beads, stones, diamantes, and needles. This Pencils have a light sticky tack lead which gently sticks to the embellishment, easily releasing it when you come to apply it. The Pick Up Pencil is quicker and easier to use than tweezers. It also leaves no sticky tack residue on the craft material and can be sharpened with a normal pencil sharpener when necessary. What are you waiting for ...? Order your Pick Up Pencil S57264 today! Demo videos are also available on our YouTube channel or via our website here. Firstly you need to make you embellishments. 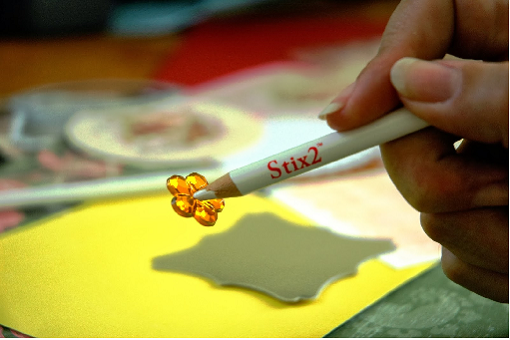 Using a non stick craft mat and glue gun, squirt some of the hot glue directly onto your mat. While this is still hot (it goes cloudy once cooled) press your acrylic stamp into the glue and set aside to cool. Then squirt hot glue directly into your silicon mould, again, set this aside to cool. Take an A4 sheet of glitter card and line up on The Groovy Card Maker to the ‘A5 Standard’ guide line; using a bone folder (which comes with The Groovy Card Maker) score down the guide line. This ensures you have a crisp edge to your card in the desired size. Cut your patterned paper to size, you can use the Layer Perfect for this, and ink around the edges with the black ink pad. Using the punch, position in the bottom right corner and punch put the heart shape. Then wrap bakers twine through the heart and around the left edge of the paper as many times as desired (I did it 3 times) and secure with a knot. Place craft foam pads on the underside of the patterned paper, this will give dimension to your card and highlight the heart aperture created by the punch. Secure the patterned paper to the centre of your card. You can pick up any stray backs of the foam pads, to tidy your workstation, with the Pickup pencil. Wrap some bakers twine around the kraft tag and adhere this to the doily with your permanent tape runner. Then secure both of these onto the patterned paper in the top right corner. By now both of your glue embellishments will have cooled. Remove the heart from the silicon mould and peel off the acrylic stamp. Firstly I covered both with a gold sheet of Shiny Transfer Foil (gold side facing you) and used my bone folder to rub over the embellishments. No additional adhesive is required and the glue doesn’t need to be warm, in fact I have done this technique with glue embellishments created days or even weeks previously. I then brushed over both embellishments with Dreamweaver metallic fix powder; this filled in any gaps and gave a little more detail to the embellishments. 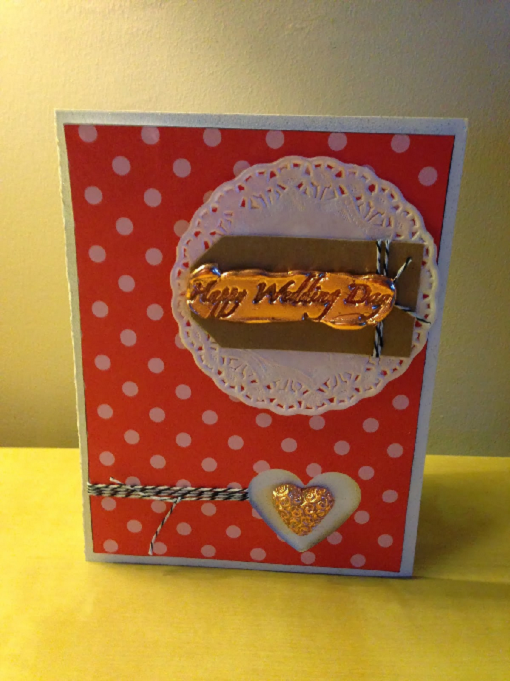 I then adhered both of these embellishments to the card, the sentiment on top of the kraft tag and the heart in the centre of the aperture, with silicon glue and left to dry.